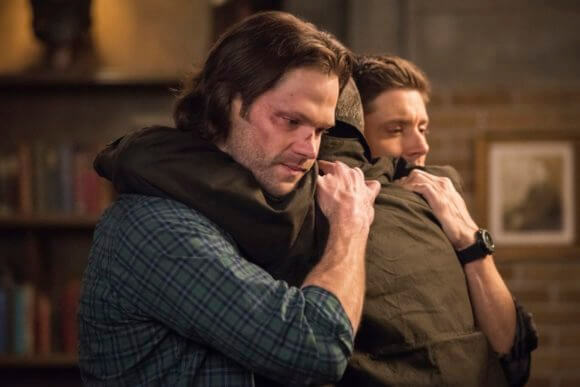 Supernatural finally did – it finally made us forget all care in the world as “Lebanon” (season 14 episode 13) will make anyone bawl with tears no matter how strong-willed you might be. In the show’s 300th episode, Supernatural harked back to its very first roots as we finally got a fresh episode featuring John Winchester (Jeffrey Dean Morgan). It was 2007 when last we saw John and so much has changed since then that John’s reaction of breaking down with the burden of everything that’s happened is as natural and as raw as it could get. Before we get down to analyzing the episode’s happenings, let’s see what went down. We start things off with Sam (Jared Padalecki) and Dean (Jensen Ackles) taking down Shady Shop Guy who killed one of their friends, Bart, to acquire a specific artifact. After killing the guy, the brothers decide to take all his stuff, because why let good occult objects go to waste? On the way back, we see that Sam and Dean have become rather well-known in Lebanon since moving there; they’re known as the “Campbell brothers.” It looks like after finding so much notoriety with the police over the years, these boys finally started going by aliases. While picking up some food to take back home, a group of teens point them out as the shifty dudes who are supposedly murderers in disguise. Here’s when things go completely stupid – the one thing wrong with this episode – one of the silly teenagers, a girl called Max, decides to carjack Dean-freaking-Winchester’s Impala because she thinks it’ll impress her crush. Not only is that totally idiotic (who in their right minds commit larceny just to impress some girl? ), considering Sam and Dean’s reputation was supposed to be of two dangerous men, but the bratty teen gets away with it as well. Sam discovers a pearl among the artifacts they’ve just plundered and finds out it has the capability to grant the person holding it whatever their heart truly desires. Before Dean can okay his plan to use the pearl to remove Michael from his head, they realize the Impala has been stolen (by that no-good teenager; yes, I really despise her already). Dean charms his way through the Post Office worker to find out the location of Max’s mother – we’d all fall for that, let’s be honest – and the boys locate the mom at the local pizza place. Once they figure out where Max will be from her mother, they head off to confront her. Getting to what we all tuned in to see, Dean makes his wish with the pearl to have what he most desires and the lights go out in the bunker. Moments later, the boys have their asses handed to them by what can only be a legendary hunter – the man himself: John Winchester is here! John has no clue what’s going on, but once he gets a look at his sons, he composes himself. After looking at just how different Sammy looks compared to how John remembers him, Dean asks his father what year he thinks it’s supposed to be. For John, the present day is 2003. Of course, nothing speaks filling someone in on the details like pouring a sizable amount to drink, and John finds out all Sam and Dean have been up to for the last 16 years. As he puts it only how John could, “So you saved the world…and now live in a secret bunker with an angel and Lucifer’s kid?” That sums it up pretty well, but Dean chimes in that it was John’s own father who led the boys here, because we weren’t already welling up with the thought of John reconciling with his sons only to see how John pieces together that his absentee father was gone for a reason. John wishes he could’ve been there with his sons every step of the way, but is reminded by Dean that it was John’s sacrifice back in season two that enabled them to get where they are now. While John’s okay with this knowledge because it meant avenging Mary’s death at the hands of Yellow-Eyes, in comes the person who holds his heart herself and John breaks down in an instant (and so do we). Mama (Samantha Smith) and Papa Winchester instantly get hot and heavy with their reunion, prompting Sam and Dean to step out so they could go at it alone. Dean’s happier than you could ever have imagined as we see him smile ear-to-ear, eyes filled with bliss. Sam puts an end to this, though. He reminds Dean that plucking John from 2003 meant their father never went missing in 2005, and that means Sam and Dean never reunited. Time will change. Dean counters that it did change, and he’s living his dream because of it. He begs Sam to let him have the thing he’s dreamt of since he was 4-years-old and have a family reunion with nothing to worry about. All four Winchesters together – the thing Dean has wanted from the bottom of his heart. But while Dean’s wish is emotional enough, we all wanted to see Sam and John together more than anything else. We get this fulfilled when Sam runs into John in the library while Mary and Dean are going over the shopping list for ‘Winchester Surprise.’ (Seriously, what is the darn recipe for that?). John takes one look at Sam and admits he made terrible mistakes raising him. He understands Sam was just a child who never had a father who listened. At first, Sam says he doesn’t want to talk about it, but John reminds him he had a lot to say in 2003 before he took off. Sam caves and confesses he felt John messed up big time, but – and here’s when I wanted to break down crying myself – that was a lifetime ago for him and every time Sammy thinks of his dad – and he thinks a lot of him – he is reminded of John lying on the hospital floor in 2006 and how Sam didn’t get to say goodbye. With that, Sam apologizes too because he wasn’t completely right himself back then and the two Winchesters tearfully grasp each other as their love overcomes any misgivings there were. Once Sam’s back in his daddy’s good graces, he agrees with Dean that they shouldn’t worry about time and accompanies him to the store. Things are never left happy on Supernatural, and everything’s off as the store owner doesn’t recognize the Campbell brothers anymore nor does bratty little Max. We then see a picture of a pouting Dean with a “Wanted” sign outside the Post Office. Dean discovers from a quick internet search that reality has changed and there’s a version of Sam out there now who’s effectively a Steve Jobs clone. This Sam drinks kale, has a law firm, and pretty much talks in a prissy, uptight manner. The real Sam figures out that a temporal paradox is happening and that time is correcting itself now that John has jumped from 2003 to 2019. If it’s not fixed, then Sam is permanently going to become that Steve Jobs wannabe, although Dean will remain cool, as he puts it. To make things even cooler than they already have been by this point, we see Zachariah – that awesome snarky angel back from season five who was killed off way too soon – and old-school Castiel (Misha Collins) who “doesn’t understand that reference” which Zachariah makes. Zachariah and Castiel head to the pizza place where they decide to kill everyone because no one wants to tell Zachariah who went all Back to the Future on Earth. (Seriously, how awesome is Zachariah?). Castiel shows us those beautiful wings he’s been missing for far too long now. Sam and Dean intervene, and Zachariah puts things together to realize they’re behind this and orders Castiel to kill them. We see old-school Zachariah as he uses his angel powers to strangle Sam from afar, but is killed off again when he makes the same mistake he made in season five: getting too close to a Winchester while monologuing, as Sam stabs him with an angel blade. For once, Castiel isn’t a punching bag and he beats both brothers to submission before Sam banishes him with a blood sigil. Back at the bunker, everyone realizes there’s no choice but to send John back, and he accepts his fate because it means Mary will be brought back to life as it happened in 2016. We get to see John finally tell Dean he’s proud of him, which I’m sure Dean has been dying to hear all his life. John says he wishes Dean had a family and feels sorry he had to live the hunter life, but Dean assures him he does have a family. 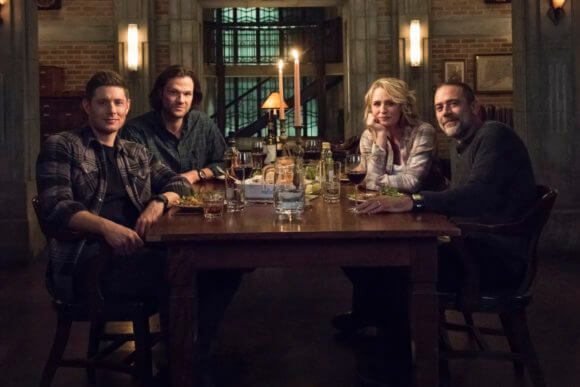 We then see, for the first time, all the Winchesters enjoy a family dinner filled with love and laughter. It’s a beautiful scene which lived up to what all of us Supernatural fans had been dreaming to see. While Sam and Dean are doing the dishes, we get the biggest character development on Dean’s part as he accepts who he is and tells Sam he likes the Dean Winchester he has become and doesn’t want any other version of him or of Sammy. The time comes for John to depart and he gives a goodbye kiss to “(his) girl” before turning his attention to his boys. Embracing his children, John tells them he loves them more than anything else and that he’s proud of them. Holding Mary’s hand for the final time, John goes back to his timeline as Sam crushes the pearl to send him back. Our beloved version of Cas comes home to the bunker and asks the three Winchesters what happened, meaning time is back where it should be. In 2003, John wakes up in the Impala and answers his phone (a flip phone for those who were too young to know what cell phones were like in 2003), assuring the young-Dean that he had the best dream ever. Phew! What an incredible episode that was of Supernatural. The 200th had given us a meta tribute, but the 300th was so much better with all its heart and sweetness wrapped up together with closure the characters, and us by extension, have been craving since the first episode. While I could definitely have done without those teen brats shown in the episode, we got the payoff with John eventually. It couldn’t have been done any better either as adding a villain to fight would’ve sullied the reunion. No, John needed a heart-to-heart with his family and that’s what we got. Sure, we could’ve done with more screen time with him, but something’s better than nothing; John’s return was well worth the wait. Supernatural deserves the highest praise for making us shed all out tears fourteen years down the line. It’s unbelievable writing on the show’s part and attests to why it has been renewed for season 15.